The DeSisti EZ-4S LED 120W Retrofit Kit is designed for use with the Leonardo 2kW Tungsten Fresnel Spotlight. It can be used to convert the tungsten fixture on the Leonardo 2kW spotlight into an energy-efficient LED Fresnel in no time. 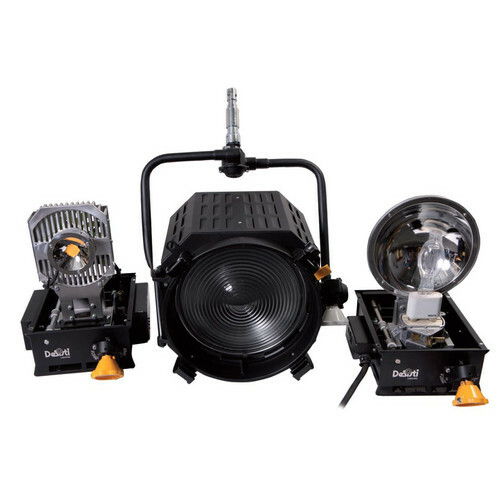 It features a bottom box with an entire pre-assembled 120W LED Tungsten-balanced CCT (Correlated Color Temperature) manual operated focus system. It only requires separating the top from the bottom housing by removing the 4 screws and reinstalling the EZ-4S retrofit kit. Furthermore, it does not require any additional electrical terminations or mechanical modifications. Box Dimensions (LxWxH) 18.4 x 18.3 x 16.8"